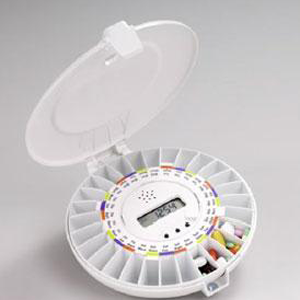 The Med-Time XL automatic pill dispenser from e-pill Medication Reminders is a lockable unit that automatically “beeps” at the designated times, and then rotates to open a compartment revealing the correct pills to take. To turn off the “beeping”, all that is necessary is to pick up the dispenser and pour out the pills. It automatically resets for the next set of medications. Each medication tray (the unit comes complete with 2 medication trays) has 28 compartments allowing the Med-Time XL to store up to a month’s supply of pills, in the right order and dosage. For example if you take pills twice a day, the Med-Time XL holds 14 days of medicine.